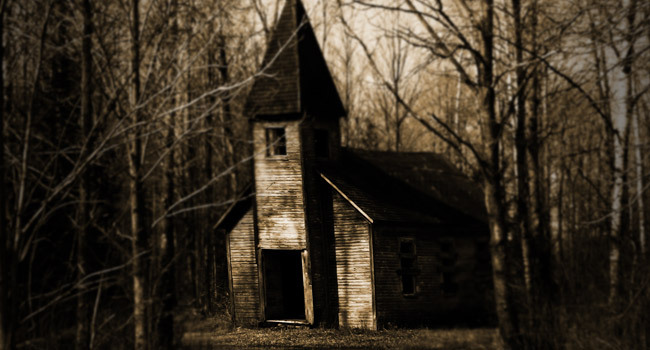 Recently I stumbled upon a photo of this ominous-looking abandoned church in Wisconsin. I saved the photo and filed it away with a plan to return to it later, research it and write about it here on the Wisconsin Frights blog. A few weeks later, while putting together the article about horror movies filmed in Wisconsin, I uncovered an article revealing that the owner of this church is Bill Rebane. Coincidentally, Rebane is the director of the legendary Wisconsin-filmed 1975 classic The Giant Spider Invasion. It turns out this church was the first Estonian Lutheran church in America, built with help from a traveling pastor from Boston, Bill’s great uncle Reverend Hans Rebane, who made annual visits to preach to the Gleason-area Estonians. Estonians came to America in the early 1900s in search of religious and political freedom. Eventually they made their home in the Gleason, Wisconsin area due a New York newspaper’s reports of its similarity to Estonia. They began holding church services in their homes. The land the church sits on was purchased in 1907. The cemetery was established on the land in 1909, with the church to follow in 1914. It remained in use until 1964. It was finally boarded up in 1970 after vandals smashed the door and windows, and stole everything, including the benches, the alter, and the bell. Rebane now owns the church, working to preserve it as a monument to freedom and the Republic of Estonia. The cemetery remains consecrated and undisturbed. There are some amazing photos of the church right here. Looking at the analytics of our website (after far too long, whoops!) and found you linked our website! We got about 120 people from this post, awesome!! This church is quite the place…and particularly amazing on that sub zero New Year’s Eve when we shot it at night!